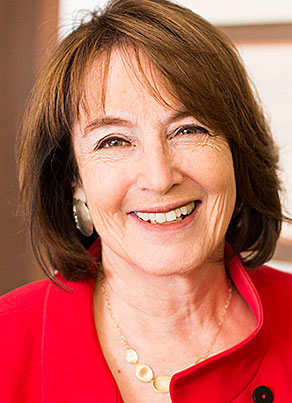 Judge Nancy Gertner is a graduate of Barnard College and Yale Law School where she was an editor on The Yale Law Journal. She received her M.A. in Political Science at Yale University. She has been an instructor at Yale Law School, teaching sentencing and comparative sentencing institutions, since 1998. She was appointed to the bench in 1994 by President Clinton. In 2008 she received the Thurgood Marshall Award from the American Bar Association, Section of Individual Rights and Responsibilities, only the second woman to receive it (Justice Ginsburg was the first). She became a Leadership Council Member of the International Center for Research on Women the same year. In 2010 she received the Morton A. Brody Distinguished Judicial Service Award. In 2011 she received the Massachusetts Bar Association's Hennessey award for judicial excellence, and an honorary Doctor of Laws degree from Brandeis University. In 2012 she received the Arabella Babb Mansfield award from the National Association of Women Lawyers, and the Leila J. Robinson Award of the Women's Bar Association of Massachusetts. She has been selected to receive the Margaret Brent Women Lawyers of Achievement from the American Bar Association Commision on the Status of Women in the Profession in August 2014. She has been profiled on a number of occasions in the Boston Globe, the ABA Journal, Boston Magazine, and The Wall Street Journal. She has written and spoken widely on various legal issues and has appeared as a keynote speaker, panelist or lecturer concerning civil rights, civil liberties, employment, criminal justice and procedural issues, throughout the U.S., Europe and Asia. Her autobiography, In Defense of Women: Memoirs of an Unrepentant Advocate, was released on April 26, 2011. Her book, The Law of Juries, co-authored with attorney Judith Mizner, was published in 1997 and updated in 2010. She has published articles, and chapters on sentencing, discrimination, and forensic evidence, women's rights, and the jury system. In September of 2011, Judge Gertner retired from the federal bench and became part of the faculty of the Harvard Law School teaching a number of subjects including criminal law, criminal procedure, forensic science and sentencing, as well as continuing to teach and write about women’s issues around the world. Nancy Gertner, Sexual Harassment and the Bench, 71 Stan. L. Rev. Online 88 (2018). Hon. Nancy Gertner, Against These Guidelines, 87 UMKC L. Rev. 49 (2018). Nancy Gertner & Joseph Sanders, Alternatives to Traditional Adversary Methods of Presenting Scientific Expertise in the Legal System, 147 Daedalus 135 (2018). The twin goals of any litigation are to arrive at a correct outcome and provide the parties with a sense that they were treated justly, even if they do not prevail. Adversarial proceedings are often perceived to be superior to inquisitorial proceedings with respect to the second goal but inferior with respect to the first. This is especially the case when proceedings involve expert testimony. In this essay, we discuss several relatively minor changes to typical adversarial processes that offer the potential of improving trial accuracy without disrupting the overall structure of adversarial proceedings. These changes include 1) alterations to the organization of the trial, including concurrent expert testimony; 2) alterations to the role of the jury, including taking notes, asking questions, and receiving written expert reports; and 3) formal expert witness codes of conduct designed to better arm experts to resist the adversarial pressures that lead to biased testimony. Judge Nancy Gertner (Ret. ), The “Lower” Federal Courts: Judging in a Time of Trump, 93 Ind. L.J. 83 (2018). To be sure, I offer only preliminary thoughts in this Essay. The Trump presidency is young. There are multiple challenges to multiple executive decisions and orders in courts across the country. A full treatment would take the reader into the robust literature on judicial decision making about context and pragmatism, with historical comparisons to other epochs where the challenges were comparable, even to empirical analyses of judging at different periods of time. I start with judging in “ordinary” times, the period during which I served. I then describe the challenges of judging in a time of Trump, and I conclude by illuminating the implications of those challenges perhaps for judicial education, law schools, and advocacy. The Future of the U.S. Constitution: A Symposium. April 14-15, 2017, Bloomington, Indiana. Sponsored by Indiana University Maurer School of Law, Indiana Law Journal & the American Constitution Society for Law and Policy. Nancy Gertner, Neuroscience and Sentencing, 85 Fordham L. Rev. 533 (2016). Nancy Gertner, Complicated Process, 125 Yale L.J. F. 442 (Mar. 22, 2016). Nancy Gertner, Opinions I Should Have Written, 110 Nw. U. L. Rev. 423 (2016). Nancy Gertner, The Judicial Repeal of the Johnson/Kennedy Administration's 'Signature' Achievement, in A Nation of Widening Opportunities: the Civil Rights Act at 50 (Ellen D. Katz & Samuel R. Babenstos eds., 2015). The Civil Rights Act of 1964, one of the most significant legislative achievements in American history, has been gutted. This is not because of Congress, or an Executive agency; it is because of the courts. Federal judges, from trial courts to the Supreme Court, from one end of the country to the other, of all political affiliations, have interpreted the Act virtually, although not entirely, out of existence. Plaintiffs in discrimination cases lose on summary judgment, more than any other party in any other type of case. If they get to a jury trial, their damage verdicts run the risk of being reduced by trial judges and their counsel's fees slashed -- more than the verdicts or fees of plaintiffs and plaintiffs' counsel in any other category of case. Even successful plaintiffs' verdicts are reversed more than jury verdicts in any other type of case. It is not simply that plaintiffs lose, but how they lose -- in decision after decision that legitimizes discriminator practices and behavior that would have been abhorrent when the Civil Rights Act was passed. This article offers a preliminary explanation for the pattern and suggestions for change. Elizabeth M. Schneider & Nancy Gertner, ’Only Procedural': Thoughts on the Substantive Law Dimensions of Preliminary Procedural Decisions in Employment Discrimination Cases, 57 N.Y.L. Sch. L. Rev. 767 (2013). Nancy Gertner, On Competence, Legitimacy, and Proportionality, 160 U. Pa. L. Rev. 1585 (2012). Judge Nancy Gertner & Melissa Hart, Employment Law: Implicit Bias in Employment Discrimination Litigation, in Implicit Racial Bias across the Law 80 (Justin D. Levinson & Robert J. Smith eds., 2012). Nancy Gertner, In Defense of Women: Memoirs of an Unrepentant Advocate (Beacon Press 2011). Nancy Gertner, Juries and Originalism: Giving "Intelligible Content" to the Right to a Jury Trial, 71 Ohio St. L.J. 935 (2011). Nancy Gertner, A Short History of American Sentencing: Too Little Law, Too Much Law, or Just Right, 100 J. Crim. L. & Criminology 691 (2010). Douglas R. Young, Nanci Clarence, James Brosnahan, John S. Siffert, Robert G. Morvillo, Nancy Gertner, Robert W. Tarun & Cristina Arguedas, Recommended Practices for Companies and Their Counsel in Conducting Internal Investigations, 46 Am. Crim. L. Rev. 73 (2009). Nancy Gertner, Alternatives to the Carceral State: The Judge’s Role, 74 Soc. Res. 663 (2007). Nancy Gertner, From Omnipotence to Impotence: American Judges and Sentencing, 4 Ohio St. J. Crim. L. 523 (2007). Lynn S. Adelman, Nancy Gertner, Richard G. Kopf, Gerald E. Lynch & Gregory A. Presnell, Federal Sentenciing Under “Advisory” Guidelines: Observations by District Judges, 75 Fordham L. Rev. 1 (2006). Nancy Gertner, Is the Jury Worth Saving?, 75 B.U. L. Rev. 923 (1995) (reviewing Stephen J. Adler, The Jury: Trial and Error in the American Courtoom (1994)). Nancy Gertner, Bakke on Affirmative Action for Women — Pedestal or Cage, 14 Harv. C.R.-C.L. L. Rev. 173 (1979).